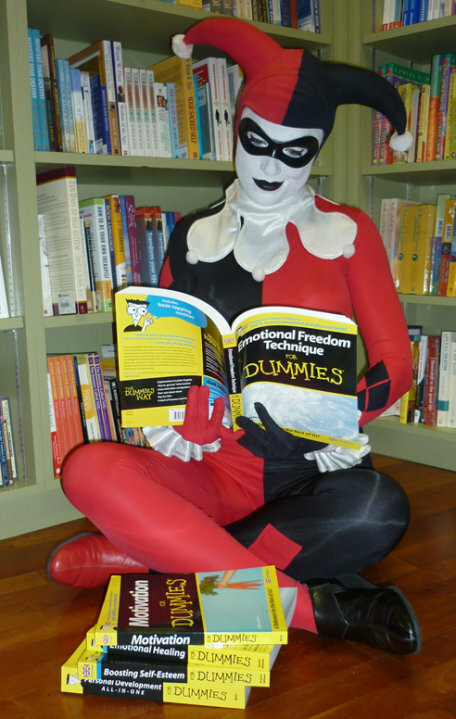 Let's be real, it's hard for Harley Quinn to blend in in that ensemble. Here she is catching up on some light reading--and will you look at that pile of books! EMOTIONAL FREEDOM TECHNIQUE FOR DUMMIES, EMOTIONAL HEALING FOR DUMMIES--Could it be her relationship with the Joker is on the rocks?? YOU HEARD IT HERE FIRST!